A person born under the Cancer Earth Snake sign is very caring. If you come across one, they will surely make themselves stand out with their unfailing love. They may seem to be an open and caring person, but when it comes to serious matters, they will show their cautious nature. Security is very important to them so don’t think these creatures will jump to the conclusion without precaution. CES are conservative so they have traditional values and beliefs that make them a good companion to have around. They are logical to the point which people normally come to them for sound advice because they can see reality clearly. The Cancer Earth Snake is a graceful creature. The way they talk, move and display all have some form of elegance. They are very wise which shows that they can absorb experiences quickly to formulate into sound judgment. 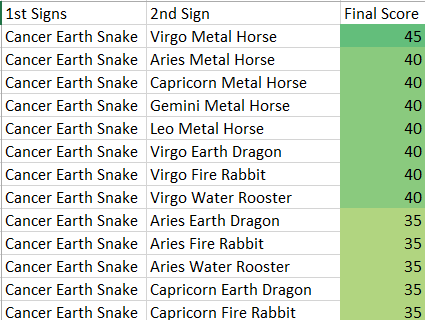 On the other hand, Cancer Earth Snake can become moody which makes them overbearing for people to associate with. They can be clingy making it difficult for them to let negative things go so easily. CES can be very selfish and will not care for other people’s interest which can hurt their feelings. They are unadventurous so don’t expect them to come up with anything fun or exciting to do. Cancer Earth Snakes can be one of the most malicious creatures. They sometimes don’t mind using unorthodox ways to achieve what they want by stomping over people. They are also possessive in which they will hold on to things and people even if it is not the best interest for everyone else.